- This item is a video card fan replacement. Don't include Mounting screws, Heatsink orother. - Please measure the fan dimension and the mounting holes distance, and make sure it will fit your video card. - The fan is rotating clockwise, please see the picture. ∞ Item Type: Cooling Fan ; Material: ABS + Metal. ∞ Model: T129215SU ; Voltage: DC 12 V ; Current: 0.50 AMP ; Rotation direction: clockwise. ∞ Fan Dimension (L x W x H): approx. 88mm x 88mm x 10mm (official website show 90mm). ∞ Mounting holes distance: approx. 40mm x 40mm x 40mm (Center to Center) ; Power Connector: 4-Pin Header. 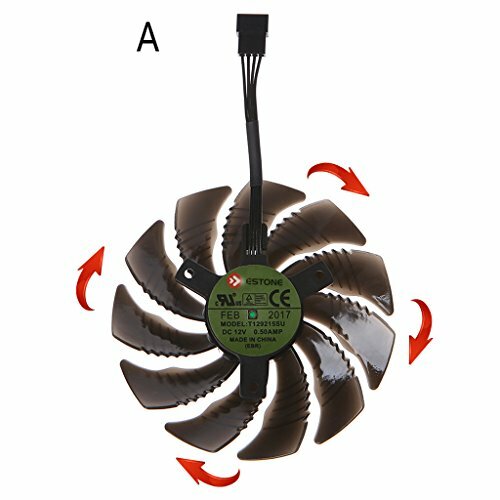 ∞ Please be sure that this Cooling Fan is right for your laptop before buying. If you have any questions about this product by RingBuu, contact us by completing and submitting the form below. If you are looking for a specif part number, please include it with your message.